Incidentally… macaroons with cocoa nibs are delicious… but they do NOT go well with bloody marys. Who’da thunk it? Not my best combo ever… reminds me of Uncle Ralphalfanator. He would make tuna salad sanwiches using the cheapest possible chocolate chip cookies he could find instead of bread…. ON PURPOSE! You thought I was joking when I called him a clown, didn’t you? Uncle Ralph performing clown communion. The Clown Communion skit was incredibly powerful, even those without faith couldn’t help but being moved by it. 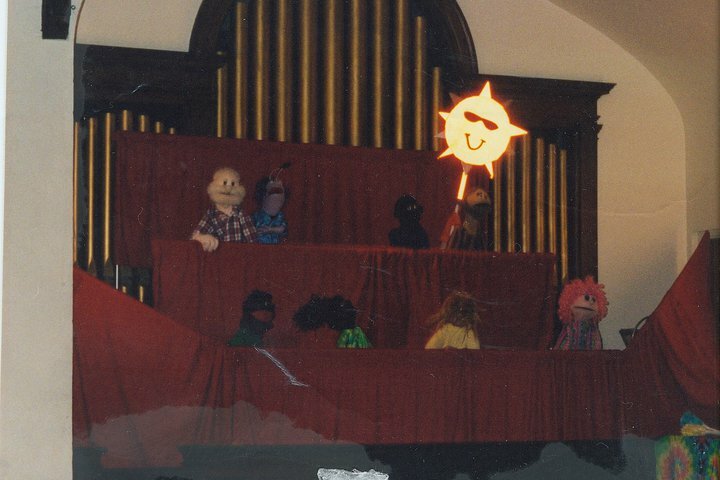 It starts with the puppets singing “Worlds Apart” by Jars of Clay (this was particularly powerful song for us as it was my cousin Patrick’s idea to use it for the puppets and he died shortly after.) The song ending segues into the pantomimed betrayal and crucifixion of Christ, performed by the clowns. 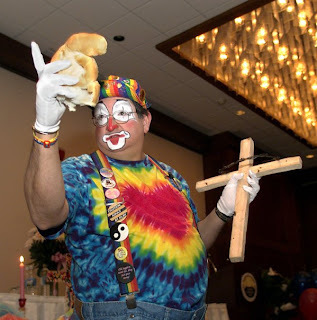 Uncle Ralph brings the loaf forward, wrapped in a tie-dyed napkin, presenting it as a baby (inevitably we would hear though the puppet stage curtains, a child’s voice say something like “that’s not a baby, that’s a bread!”) Other clowns come forward then, bringing the cross and the crown, the loaf would then be placed upon the cross and crowned with thorns. The loaf would be removed and placed upon the altar, and the cross “poured” into the pitcher to be transferred to the challis, symbolizing the blood. Following this, the blessing would be made and an invitation extended to EVERYONE (this is not the norm in all churches) to come to the Lord’s table. In 1984 Uncle Ralph started Cleveland Praise Ministry as an outreach to inner city youth. 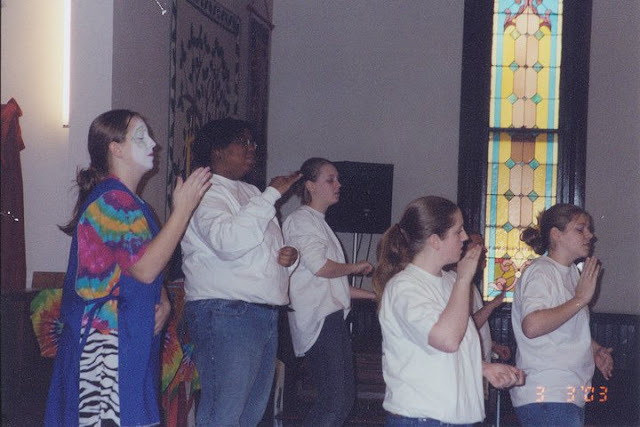 It was a non denominational christian performance group that traveled from church to church to present a new form of a traditional church service. All of the elements (sermon, praise, benediction, etc) were taught using contemporary christian music. Clown and puppet skits acting out the stories from songs, interpretive sign language to acapella music, each of us signing for a different voice. CPM toured all over the eastern USA. Most of us nieces and nephews got to be part of the group for at least a little while, as a result, I’m pretty close with some of my cousins. I was a puppeteer, propeteer and a signer for about 8 years, from 7th grade, on… going to the events i could make while in college. In 2004, the group dibanded (not without trying to keep it going) when uncle Ralph felt called in other directions. He passed away a few years later…. He was the Glue of CPM. we still get together for reunion performances every now and again at my cousin’s church, her husband, also a CPMer, is now a Pastor. … regardless, i know we’re in the chorus because we’re all doing the same sign. While I am no longer active in the church… There will always be a very special place in my heart for CPM. So many fond memories throughout the course of my adolescent life. We traveled to churched within 4 hours to perform at least once a month and in the summers we did 2 week tours(any longer and things got ugly, afterall we were mostly teenagers… and family). I got the opportunity to tour with CPM to Altanta, Ga, to Baltimore, Md (twice! ), to New York City, and everywhere in between! The NYC tour was probably the most powerful to me, being able to bring something positive to the community in NYC in the summer of 2002 was absolutely amazing. My favorite, I think was the workshop we did in Harlem after performing. We got to teach kids to sign a song, to control the puppets, and we painted their faces. We, and they, had a blast! and bonds of friendship that will last forever. Between CPM and my parents’ love for travel, it’s no wonder my sister and I are nomads. That’s very cool of you and your family to have done that, and a great opportunity for you to be creative and travel. Oh man, this totally reminds me of when I first met you in highschool 🙂 I completely forgot how active you were in the church. It’s so strange to think that I could have fogotten that when it was such a huge part of who you were back then. I blame the changes mostly on the Enclave… and maybe a little bit of myself.